My family travels there every year and brings my husband one home. This year his shirt got messed up so I ordered him 2 for his birthday and great service and loved the product!! i am so pleased that i was able to purchase a new T shirt. as as the one i purchased in the late 70's was beginning to become tired and worn. 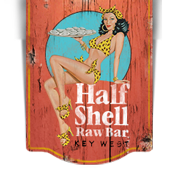 the two times i visited Key West i have always headed to the Half shell for a good eat, after the evening gathering at Mallory Square. Click the button below to add the Eat It Raw Mens Tee to your wish list.